Dr. Leblanc is an expert in law, governance, and ethics, and is listed under York University's Experts Guide. Richard Leblanc is a dynamic speaker who has been called upon by the media to give his views on board and individual director effectiveness across all sectors and industries. 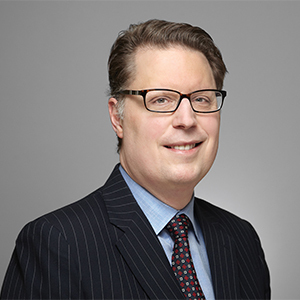 In demand by corporations and associations across Canada and beyond, Professor Leblanc uses his extensive knowledge and research in governance to assist corporations and individuals alike in understanding and anticipating best corporate governance practices. He has studied the boards and interviewed directors of Fortune 500 companies, as well as training regulators and directors from Central and South America, Europe, Asia-Pacific and the Far East. Board, committee and director assessments. Questions are surfacing about SNC-Lavalin's corporate governance and disclosure practices as the scandal surrounding the company continues to grow. Richard Leblanc, professor at York University joins BNN Bloomberg to discuss. CBC News update on the status of the deferred prosecution agreement that’s at the centre of the SNC-Lavalin affair, featuring Dr. Richard Leblanc. Leading governance expert Richard Leblanc and Jo Iwasaki of ACCA discuss themes and issues that commonly recur across the debate on corporate governance. Richard Leblanc, professor at York University, joins BNN Bloomberg to react to the newest board members of Hydro One. He says it's a much better board consisting of directors who appear have been chosen for merit rather than political reasons. Richard LeBlanc, corporate governance expert and a professor at York University, joins BNN Bloomberg to discuss the resignation of Hydro One's CEO and entire board of directors at the hands of new Ontario Premier Doug Ford. LeBlanc says the end result "is very good for ratepayers" and discusses the challenges Ford faces in reshaping the company's leadership. Listen to Dr. Leblanc's take on recently announced Hydro One board compensation—just before the provincial election. Richard LeBlanc, corporate governance professor at York University joins BNN to provide perspective on the Steve Wynn misconduct claims, what could be next for Wynn Resorts, and the company board's role in all of this. 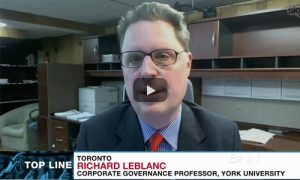 Richard LeBlanc, corporate governance expert at York University joins BNN to weigh-in on Loblaw's response to its price-fixing scandal as registration for $25 vouchers opens today. Richard Leblanc, professor of corporate governance at York University, joins BNN to provide perspective on the ongoing duel between the Liberal government and the Tories over ethics-related controversies facing Finance Minister Bill Morneau. Now the Conservatives are calling for his resignation. Richard Leblanc, professor of corporate governance at York University joins BNN to dig into the Uber management debacle, and where the company goes from here. Inside America's Boardrooms: Will your town at the bottom impact shareholder value? To tackle this important topic, we’re joined by Dr. Richard Leblanc (professor, lawyer, governance expert, and author of the recently released The Handbook of Board Governance). Richard LeBlanc, associate professor of governance law and ethics at York University, on Bombardier's dual-class share structure. Bloomberg is reporting the Healthcare of Ontario Pension Plan is behind Home Capital's line of credit. The CEO of HOOPP is also a Home Capital shareholder and on the board. York University professor Richard Leblanc tells BNN, if the news is true, this presents a clear and material conflict of interest. Valeant CEO Joseph Papa took home US$62.7 million in 2016 as the stock dropped, providing an 85-per-cent negative return for shareholders. 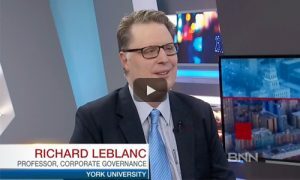 York University professor of corporate governance, Richard Leblanc joins BNN to discuss executive compensation. CTV NEWS:Your Morning – Why are the big five Canadian banks being investigated? A federal investigation is being launched into business practices of the big five Canadian banks. York University's Richard LeBlanc explains. Watch Dr. Leblanc discuss how Canada's rules permit figurehead directors. Watch Dr. Leblanc discuss his new book, the Handbook of Board Governance. Richard Leblanc, talks about Former Valeant, Phildor execs arrested on fraud, conspiracy charges. Richard Leblanc, associate professor of law, governance and ethics at York University joins us to discuss what TD Bank and TD Ameritrade's acquisition of Scottrade may signal regarding potential succession plans at the bank. Richard Leblanc is put on the hot seat to discuss key steps to creating a great board—and how investors can know how effective their board really is. The numbers are in. Richard LeBlanc, Associate Professor, York University, joins BNN to stoke the executive compensation debate with the annual ranking of Canada's highest-paid CEOs. Watch Dr. Leblanc talk about Proxy Access for boards and how it could be a corporate governance game-changer. York University’s Richard LeBlanc on the tight networks of friends on corporate boards. Law professor Richard Leblanc on the governance dilemma over corruption. Richard Leblanc, Associate Professor, Law, Governance and Ethics, York University joins BNN to offer insight on corporate Canada's CEO debate. Watch Richard Leblanc discuss the importance of board diversity and how a diverse board can be beneficial to a company. Watch Richard Leblanc on BNN provide insights on the world of investing and markets as key investment locations. Watch Richard Leblanc on BNN talk about executive compensation. This is part 1. Part 2, 3, and 4 are in the related videos section. Watch Richard Leblanc on BNN talk about Stronach's consultancy fee at Magna. Watch Dr. Leblanc present an Introduction to Corporate Governance at CANCON 2014. Link has video and slideshow. Watch Dr. Leblanc discuss Alberta's recently released sunshine list that reveals the salaries of all public employes earning over $100,000/yr. Watch Dr. Leblanc appear on McCuistion for a talk on the current state of Boards and what strategies can be used to make them successful. BNN: Telus Debate: What is Best for Shareholders? Watch Dr. Leblanc appear on BNN's August 29th episode all about the Telus shareholder debate. Part of the Nonprofit Risk Management Conference. It talks about recruiting, developing and assessing the right directors for your board. Webinar to 1,800 directors on not for profit governance, including recruitment, development, assessment, questions and answers. Keynote presentation on a model of board effectiveness, including structure, membership, process and tasks. Board of Directors Gender Parity Act (S-206) at the Senate Committee on Banking, Trade and Commerce. Watch Dr. Leblanc on BNN with Allan Small as they talk about the recent vote to keep Jamie Dimon at JPMorgan. Presentation given through the University of Texas at Dallas, (IECG) Institute for Excellence in Corporate Governance. Television interview on the CPP Strike and the board’s structure change. (Richard appears at the 6:30 mark). Spoke on fifty Corporate Governance related points in a one hour session. Trends and Issues in Corporate Governance Since The Financial Crisis. Plenary discussion on strengthening diversity initiatives in the workplace and on boards of directors. Television interview on board leadership, industry knowledge, teamwork, the capacity to challenge and other attributes. Television panel discussion on governmental accountability, oversight, compliance and best practices. CBC Radio - Senators on Corporate Boards? Updated on March 21st, 2019.